The National Council for Hotel Management and Catering Technology and the Indira Gandhi National Open University conduct a joint program under which admissions are provided for Degree in B.Sc. in Hospitality and Hotel Management. Applications are invited for Three Year Degree course on the basis of JEE 2014 exam. • Candidate must have passed HSC or its equivalent with English as one of its subject. • Candidate must have passed English subject in the qualifying exam. • Candidates appearing in HSC can also appear for JEE 2014 on provisional basis. • General and OBC – Age of candidate should not be more than 22 years as on 01-07-2014 (i.e born after July 01, 1992 are eligible). • SC/ST – Age of candidate should not be more than 25 years as on 01-07-2014 (i.e born after July 01, 1989 are eligible). 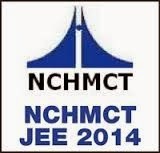 • Timings of JEE 2014 – 10.00 a.m to 1 p.m.
For more information visit NCHMCT website www.nchmct.org.